Chris Froome’s hopes of winning the Tour of Catalonia are almost certainly over after he suffered a crash during Tuesday’s second stage, which was won by Australian Michael Matthews. With less than 40 kilometres to go, four-time Tour de France champion Froome fell along with Bora-Hansgrohe pair Andres Schillinger and Jay McCarthy before finishing more than 13 minutes behind Matthews of Team Sunweb. Froome, who is racing for the first time since his season debut in January, was left with a nasty gash down the top of his right leg and the Team Sky rider will surely have to concede defeat in what had been dubbed a showdown with Movistar duo Alejandro Valverde and Nairo Quintana. 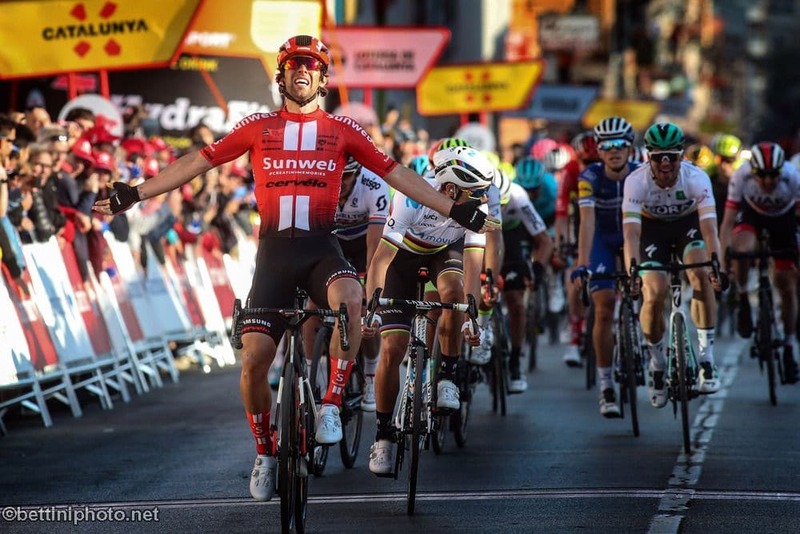 At the end of a 167km-stage from Mataro to Saint Feliu de Guixoles, Lotto Soudal’s Thomas de Gendt remained in the overall lead following his victory in the first stage on Monday and even extended his advantage after a succesful attack on the final climb. De Gendt sits 2min 47sec ahead of Valverde in the general classification, with Matthews a further second behind in third. The Belgian was the first to emerge over the Alt de Romanya before Valverdeand Quintana seized the initiative in the sprint with just under 8km left. Maximilian Schachmann and Dion Smith both made late challenges but it was Matthews that pipped Valverde to the line, with Mitchelton-Scott’s Darryl Impey coming in third. “After my bad luck this year it’s just incredible. I’m so happy. Wednesday’s 179km third stage heads north-west into the mountains finishing in the resort of Valter at 2000m altitude in the Pyrenees. 8. Steven Kruijswijk (NED/JUM) s.t. 9. Luis Angel Mate Mardones (ESP/COF) s.t. 2. Alejandro Valverde (ESP/MOV) s.t. 3. Daryl Impey (RSA/MIT) s.t. 4. Maximilian Schachmann (GER/BOR) s.t. 5. Odd Christian Eiking (NOR/WGG) s.t. 6. James Knox (GBR/DQT) s.t. 7. Patrick Bevin (NZL/CCC) s.t. 9. Davide Formolo (ITA/BOH) s.t. 10. Daniel Martin (IRL/UAD) s.t.